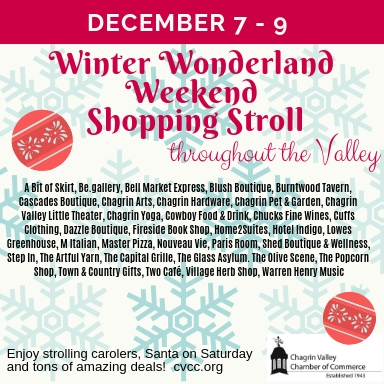 A Winter Wonderland Weekend of shopping at participating locations throughout the Chagrin Valley! You'll find special deals all weekend long! Carolers will be roaming around the village Friday and Saturday evening, and Santa strolling around town Saturday from 6-8pm. Make sure to pick up your Proud Shopper Card at the Chamber office to receive your deals! Click here for participating stores! Check participating stores for hours.